For almost 4 years I have been working with Adiam from Dubaruba. 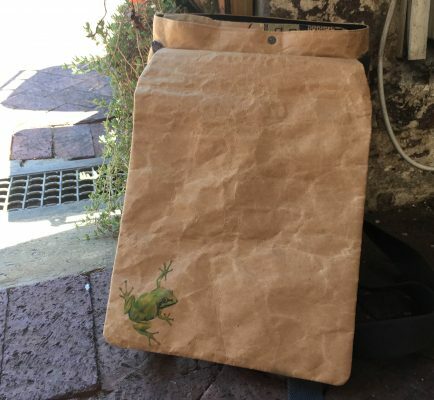 She started selling our products in 2013 and has been able to connect with many stores that fit our targeted profile and supply. She has built up orders for us and is now our exclusive distributor for Germany, Switzerland and Austria. To grow orders Adiam found out about Paperworld and applied. 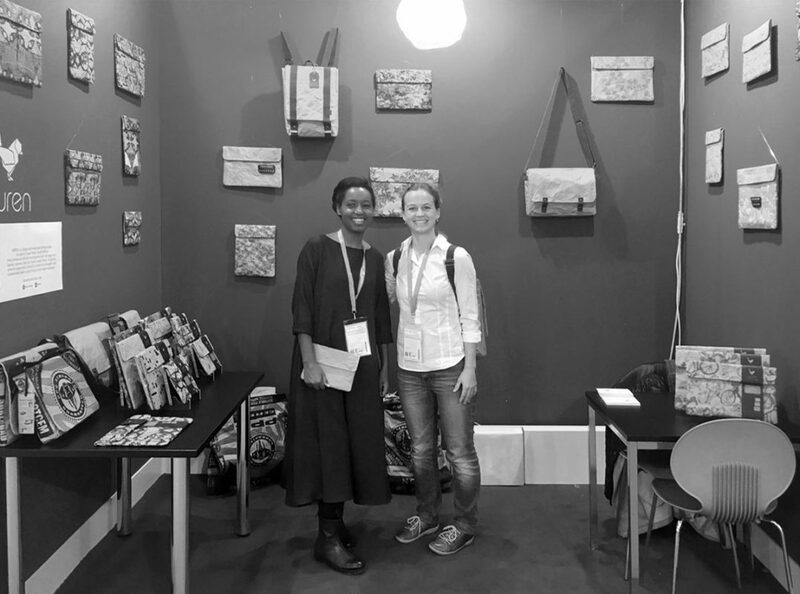 I was already exhibiting at Ambiente at the same venue two weeks later so it made sense for me to join her on the stand and hopefully be of assistance. What a wonderful experience it was working with her! We had a lot of fun and learnt a lot from each other. The stand also did really well! Adiam’s concept was to hang WREN bags and sleeves with fishing line. This worked really well as they floated and hung suspended in space. Paperworld was like going to disney land for a stationary lover! 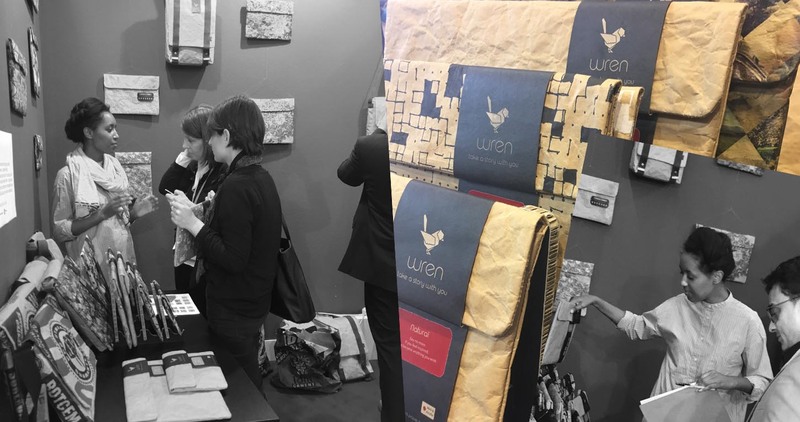 It is an exceptionally beautiful show with halls full of beautiful paper products. 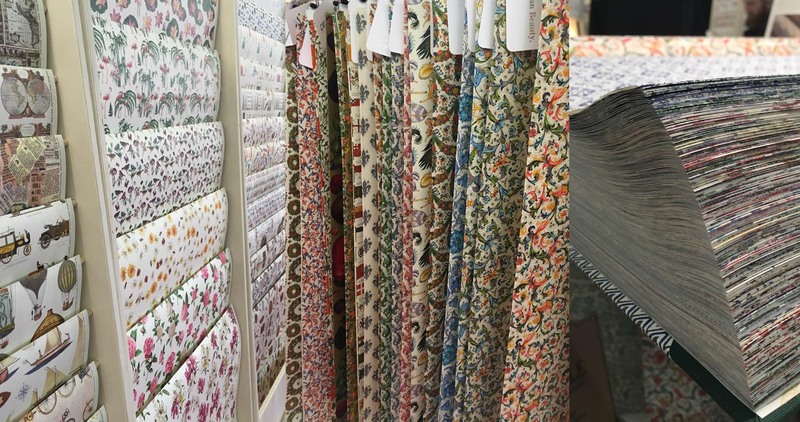 Hall 6, which is where we were, hosted the latest paper and stationary trends and most notable brands in the industry. Other halls featured art supplies and more stationary…. It was heaven for me who has sworn that if I ever began a business again I would go into ribbons, packaging and stationary. Here are some of my favourite finds. There were many stands filled with the most gorgeous wrapping papers I have ever seen. Some hand printed, others by very old and traditional printers. It was a delight to flip through hangers and books of printed paper! 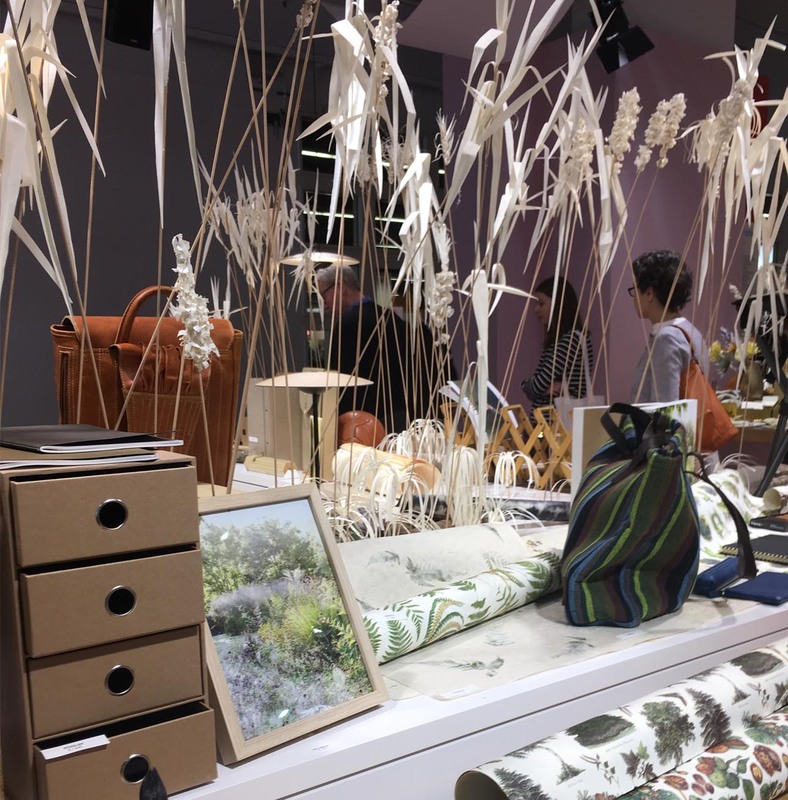 The trend presentations were gorgeous and very inspiration with handmade paper grasses giving them height and more tactile interest. The Hanji stand that was almost next to us was a highlight for me. I was also lucky enough to attend their workshop afternoon where they told us about the paper making process and the special characteristics of this paper made from mulberry plants that is unique to Korea and integral in it’s history as a country. 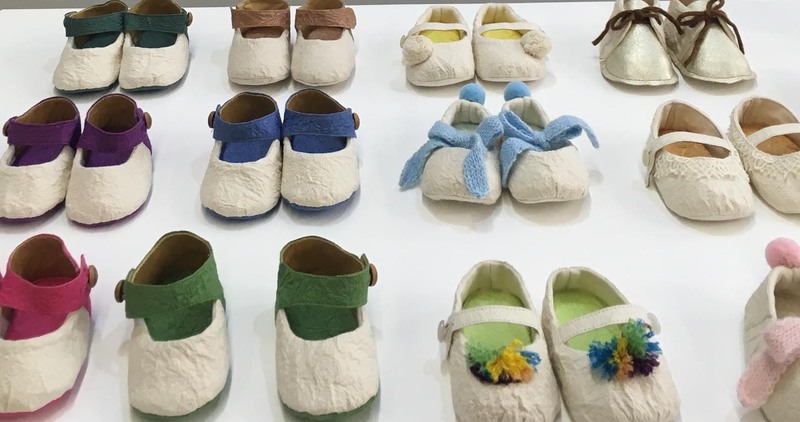 These baby shoes were made out of Hanji paper by Haeeun Lee, Chunggoo Kwon. Hanji is pliable, easily shaped, breathable and is a good temperature moderator. These shoes can also be bought as “make them yourself” kits for mothers to make their child’s shoe adding to the special and symbolic memory. 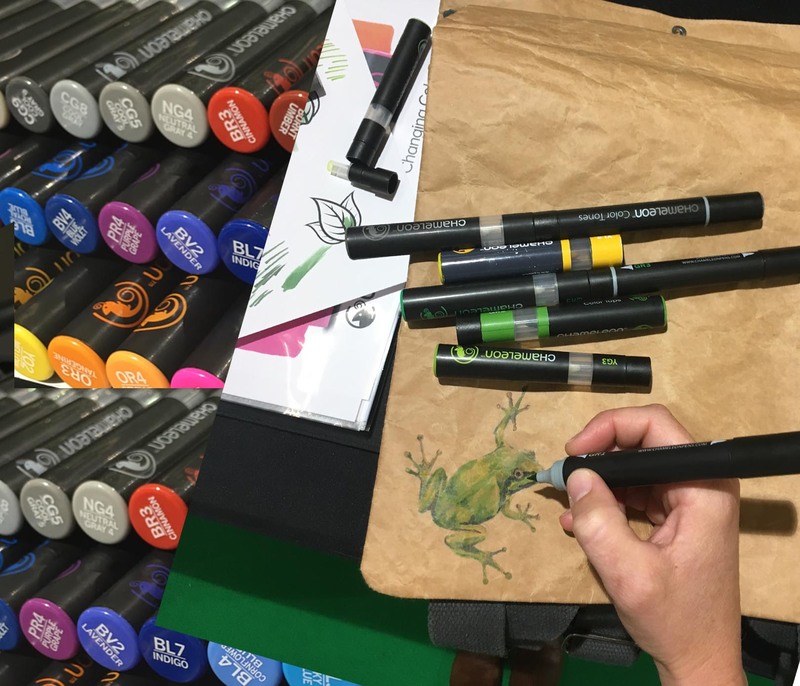 In one of the art suppler halls I discovered a new type of alcohol based marker that can be blended from one colour to another. The blending feature takes quite a bit of getting used to. I gave my backpack a tattoo Tree-frog. Visit the Chameleon Pen’s website to learn more. Thank you Adiam for letting me join you at Paperworld! This entry was posted in Blog and tagged 2017, adiam, alchohol markers, baby shoes, blending pens, cameleonpens, chameleon pens, dubaruba, haeeun lee, hanji, hanji shoes, hanjipaper, korea paper, korean paper, messe, messe frankfurt, paper bags, paper trends, Paperworld, paperworld 2017, stationary trends, trade shows, treefrog, wrapping papers, Wren bags.